Samson Awnings & Terrace Covers supply & install a wide variety of retractable high quality Sun Awnings to act as a protective canopy against the heat and light of the summer. A sun awning is a versatile effective outdoor cover suitable for both the home and business. 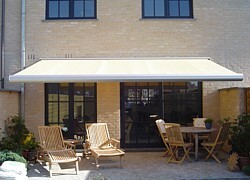 The major benefit in our sun awnings is the fact that they can be completely retracted out of view when not in use. This allows you to enjoy the natural sunlight, but still enjoy the beauty of the outdoors in the shade when it becomes too hot – all from the click of a button or simple wind of a handle! 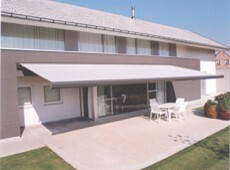 Sun awnings can be installed anywhere. Common installations for a Samson sun awning are often situated on a clear wall space above a door or window on the patio area however our adaptable range of awnings can be installed under eaves, balconies, building overhangs and more. Almost any bracketry can be manufactured to assist in the installation where it may seem inpossible to fix an awning due to height or obstacles on your house wall. If you are unsure whether your home is appropriate for the installation of a sun awning, call us on 0800 328 6250 and arrange your FREE survey! The range of sun awnings available extends to over 40 different models from top of the range manufacturers such as Markilux and Weinor. Other specialist manufacturers, such as Gibus, enable us to offer much larger aluminium and timber pergola and veranda type covers at very large sizes indeed. These retractable roof systems are suitable for domestic or commercial use and offer more than just sun protection. I need sun protection – but choose why a sun awning? Sun Awnings and fixed sun canopies are becoming an evermore popular purchase in the steadily growing solar shading market due to their simplistic designs, ease of use and ability to retract out of view when not in use. Always look to purchasing an awning manufactured and developed in Northern Europe is our advice to ensure you get a product capable of dealing with our changeable weather. Safety systems can easily be included in your installation to automatically retract your awning if the wind speed gets too high and the awning is left open. When compared to other products such as the Patiola and Large Umbrellas, a Sun Awning is always the more favourable choice with customers due to the unobstrusive nature of its canopy design and lack of framework which protrudes from the ground. And whats more, most manufacturers offer large warranties to reinforce their strong trust in their products. How does a retractable sun awning work? Essentially the retractable sun awning is made up with extruded aluminium arms with the knuckle joints to give stability. When opening the awning, the knuckle joints remain strong and adjust until the sun awning is fully extended. Some knuckle joints can provide angling options with an extruded aluminium front leader bar for design purposes – this is where the fabric (normally acrylic) is attached. When the sun awning is retracted the fabric is rolled back into the cassette cover and the leader bar sits in the cassette to give a neat appearance. When operating a sun awning, there is the choice of manual and automatic operation. When manually operating your sun awning, a rod crank is supplied with a universal joint on the underside of the awning. All it requires is a simple twisting motion and your sun awning is fully open and ready to enjoy. If it is electrically operated it will have a motor housed in the roller tube. Electric motors can be powered through the use of a remote control handset which gives you the comfort, ease and luxury of sitting in the shade without having to move a muscle. Listed below are basic descriptions of the three awning categories with a few recommended sun protection awning models. A full cassette sun awning is an awning in which the folding arms, awning material, rollers and all other moving components are fully encased and protected within the closed cassette. This ensures the long term durability and operation of the awning is preserved whilst all functional moving parts of the awning remain low-maintenance and require less care than semi and open cassette awnings. A semi-cassette sun awning is an awning in which the awning materials, rollers and all other moving components are partially encased within the cassette. Whilst the semi-cassette offers varying levels of protection, the folding arms remain unprotected and vulnerable. 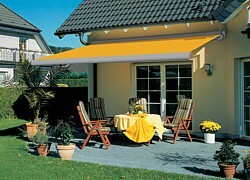 While this still offers a high level of protection to the awning components, they still feel the effects of weathering. This means they need to be maintained and serviced more often than a full cassette model. An open cassette sun awning remains totally uncovered against the rain due to the fact it does not have a cassette cover. Therefore this awning is ideal for installations under balconies, eaves and buildings with overhangs to provide the protection to the awning. There are two distinct advantages of having an open cassette sun awning; the first is a competitively low cost for such a high-quality product, and the second is a large projection width. Once an awning projects past a certain distance, it is unable to be contained inside a cassette which makes open cassette sun awnings ideal when larger projection sizes are needed.